Ice Maker is dispensing the wrong type of ice, why is this? Ice Maker is dispensing the wrong type of ice, why is this ? Ice maker can dispense cubed or crushed ice. Press the Ice / Water button to select the ice type, or water. The icon illuminates over the current selection. If you select cubed ice, and a small amount of crushed ice is dispensed, that is normal. A common cause of the ice maker dispensing crushed ice only is; the freezer temperature is too cold. If the freezer temperature is too cold the ice will shatter when it is harvested from the ice maker. Raise the freezer temperature. If you select cubed ice and all crushed ice is dispensed, or vice versa, your ice dispenser is not functioning properly. 1. Remove the ice bin. Remove the ice bin by pulling the lever towards you and slide the bin out. 2. Empty the ice in a suitable container. 3. Check the discharge area. Turn the ice bucket upside down and examine the discharge area. It should be in the closed or crushed ice position. 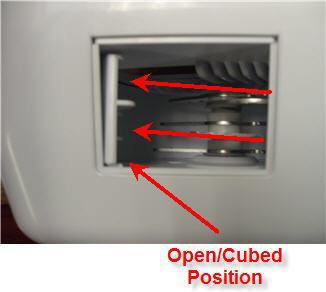 If your ice maker is in the open/cubed position check for any ice build up in this area. It should be in the closed/crushed position. Clean any residual ice in this area by running hot water through the ice bucket until no ice remains. 4. Check the actuator rod. The actuator rod is a steel rod the runs along the bottom of the ice maker. Move the actuator rod and look at the discharge chute. It should open and close easily. 5) Reinstall the ice bin. Make sure the ice bin is fully installed and latched. If the ice bin is not fully installed and latched, the ice function will not operate properly.